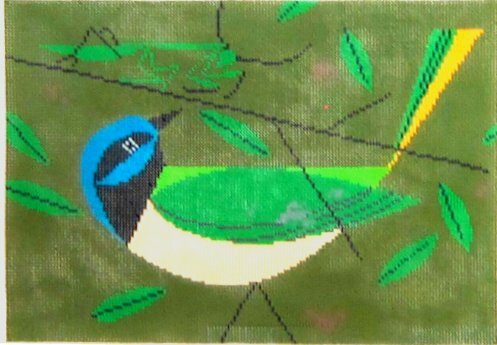 A Charley Harper contemporary needlepoint called Green Jay HC-G237. This easy to stitch needlepoint design features jay bird with striking green colors. The needlepoint design area measures approximately 12" x 8.25" and is hand painted onto 13 mesh canvas. It is sold canvas-only, or with your choice of threads. Use the drop-down menu to make your selection and see prices. We use DMC cotton floss, or Planet Earth wool and silk fibers. The design is stitch-painted which means there is no guess work as to where to place what color and it is suitable for a beginner needlepoint design. If you wish to purchase stretcher bars we recommend a pair of 16" and a pair of 12", plus some thumb tacks. This needlepoint design is suitable for a beginner stitcher. If you are new to needlepoint you might want to consider adding the How To Needlepoint booklet to your order as it is a great, easy to follow resource. This Chorus Line Charley Harper needlepoint canvas is usually in stock and ships in a few days. But, because of the high demand for Charley Harper needlepoint sometimes we run out, so if you're in a hurry you can always check availability with us before you order.